In stock -This product will ship today if ordered within the next 1 hours and 56 minutes. 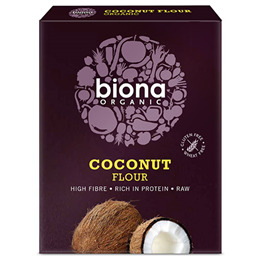 Biona Organic Coconut Flour is made from the finest selected organic coconuts. These coconuts are grown and processed according to strict EC rules for organic agriculture. No chemical fertilisers or pesticides are used - our environment is being protected and the natural balance remains intact. Below are reviews of Biona Organic Coconut Flour - 500g by bodykind customers. If you have tried this product we'd love to hear what you think so please leave a review.